Ever woken up to find yourself facing a giant postcard? Well it happened to us at Chalina Estate this morning. 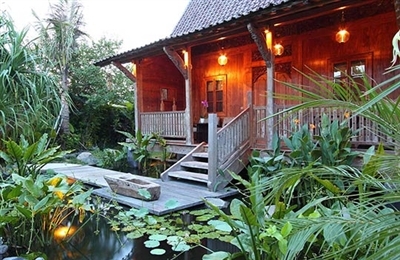 Having left the master suite curtains open, we awoke to rice fields and coconut trees of the deepest green against a backdrop of blue sky and mountains, all neatly framed by wide glass doors. Wish-you-were-here picture perfect and not a bad way to start a day. And it just got better and better. We had a leisurely breakfast of perfectly cooked eggs and too much coffee before eventually relocating to the sun beds beside the pool to bake in the sun, read books, swim and be waited on by the butlers: and hardly a man-made noise to be heard all day, unless you count the clink of ice cubes in an empty glass anticipating a refill. 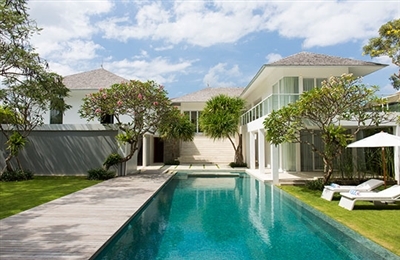 Two-and-a-bit years on from our original visit, Villa Sarasvati has matured and multiplied but lost none of its former beauty. Sarasvati is now part of an enclave of five villas (known as Dea Villas), so some of the neighbouring rice field land has been forfeited but there are still rice field views from the upper floor and all of the new buildings within the Dea Villa complex are now complete and available for holiday rentals, offering a whole host of renting options for large groups. The next-door Villa Radha (formerly known as the Gladak House) and its garden is now a separate entity (unless rented in conjunction with Sarasvati), but that’s okay because this is compensated by some new communal facilities, including a children’s playground, a gym and a dedicated spa. 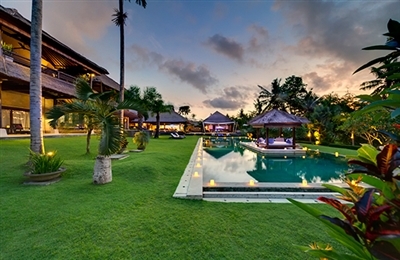 Overall, we concluded that Villa Sarasvati has been exceptionally well maintained and is still as eclectic as ever. With the addition of two more properties, the Dea Villas enclave is now busier and more commercial, so while the ambiance may have lost a little bit of its original laidback vibe, the team of staff has of course grown (they serve the whole enclave) and they have become even more slick and professional, yet we still found the service to be very personal. What we loved about Villa Sati (among many others things) was the privacy and the space. This is the sort of place where you can sneak away from your companions and hide in your own huge bedroom-come-sitting-room. All the rooms are the same so there’ll be no fights over who gets the best one. It was great to have use of all the communal facilities too, we both enjoyed an excellent massage in the spa, and managed a workout in the gym on the Powerplate machine. For anyone planning an intimate Bali wedding, we thought the little amphitheatre in the garden next to the pool, would be a very cool setting for the nuptials.